By Azzief Khaliq in E-Commerce. Updated on November 13, 2018 . Everyone knows that e-commerce is a constantly growing part of the larger retail and commerce landscape, but did you know that mobile commerce is growing at an even faster rate? 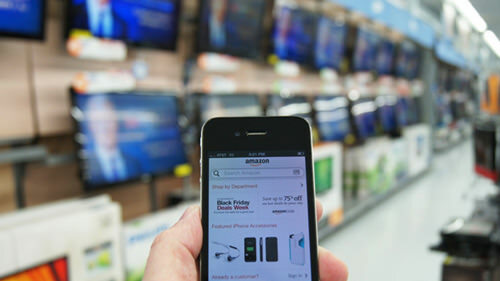 Given the growing number of smartphone and tablet users, this is understandable, but there are still a lot of e-commerce retailers out there that haven’t been keeping up with the times and are still serving up unoptimized, unresponsive online stores to mobile users that can very easily drive mobile customers away. To boil it down to the very basics, mobile commerce (m-commerce) is electronic sales and commerce – in other words, e-commerce – using wireless handheld electronic devices such as smartphones and tablets. To be clear, m-commerce is not a separate entity from e-commerce: instead, it’s a more specific sub-group of e-commerce transactions that involves the use of smartphones and tablets, instead of desktop and laptop computers. The main goal in m-commerce is to ensure that your business’ shopping experience is well-suited to the smaller screen sizes that we see on smartphones and tablets. Concepts such as responsive design and a mobile-friendly user experience are all important for your business’ m-commerce success, as well as mobile apps, but we’ll be covering all those in a later post. For now, let’s take a look at why m-commerce is important for your business or e-commerce venture. The first, and most important reason you should care about mobile commerce is simply the fact that more and more people now own smartphones and tablets and connect to the Internet using these devices. 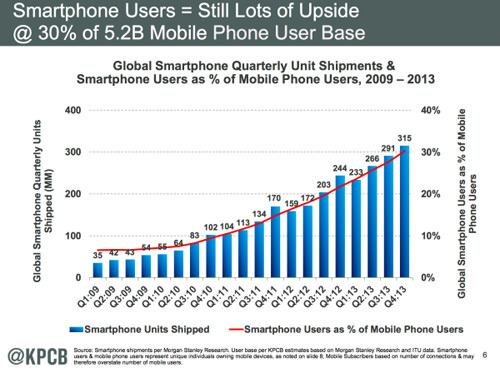 According to Mary Meeker’s 2014 Internet Trends report, smartphone usage has consistently grown over the past few years, so much so that 30% of mobile users are smartphone users. In addition, eMarketer indicates that more than 2.23 billion people worldwide will go online via mobile at least once a month, with the number of mobile Internet users increasing 15.6% globally in 2014 and continuing its double-digit growth trend all the way through 2016. On a related note, Intelligent Positioning have predicted that, in the United Kingdom at least, smartphone and tablet Internet access will finally overtake desktop Internet access share by July 2014. The Pew Research Internet Project found that, by May 2013, almost two-thirds of all mobile users used their phone to access the Internet. These users aren’t mobile-only, but the fact that they do spend a statistically significant amount of time accessing the Internet using their mobile phones means that there’s definitely a chance that they’ll be doing some shopping on their device(s). When you consider that mobile phone owners between the ages of 18 and 29 were the most likely to access the Internet using their mobile phones, and the fact that males and females between the ages of 18 and 34 were found to be most likely to engage in online shopping activity, then you have a very good reason to accommodate these users by making sure your websites are mobile-friendly. Also, we musn’t forget the often forgotten, but significant, demographic of Internet users that only connect to the Internet using their mobile devices. 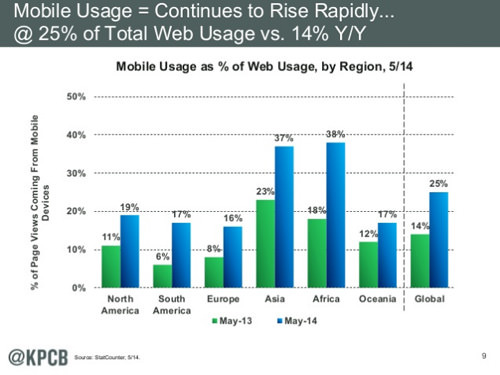 These mobile-only users are far more prevalent in emerging markets such as Indonesia and India, but there’s a significant mobile-mostly user base in the United States, too. 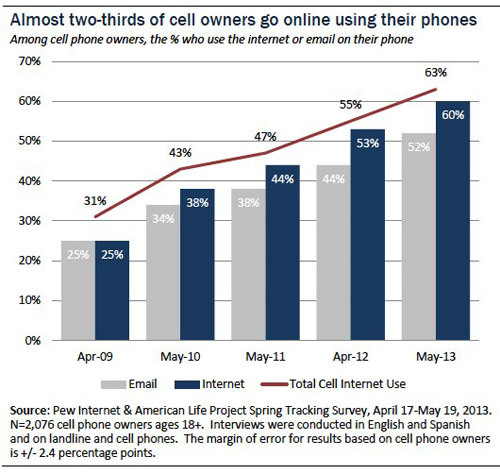 The Pew Research Internet Project found that 34% of American cell Internet users accessed the Internet mostly using their phones. 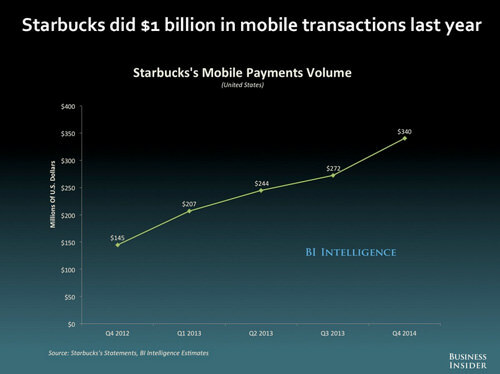 If these numbers aren’t enough to sway you, Forrester also expects mobile commerce transactions in the United States to total $114 billion in 2014. $76 billion will be from tablets, while the remainder will be from smartphones. Invesp also predict an increase in mobile commerce spending, although they’re a bit less bullish on the matter: their prediction is that mobile commerce spending will reach $86.8 billion in 2016. 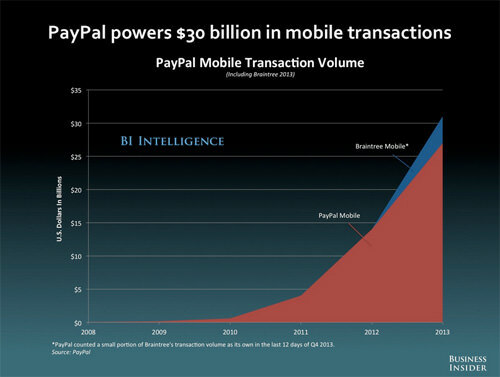 Not as bullish as Forrester, but still a vote of confidence for the sustainability of the mobile commerce trend. 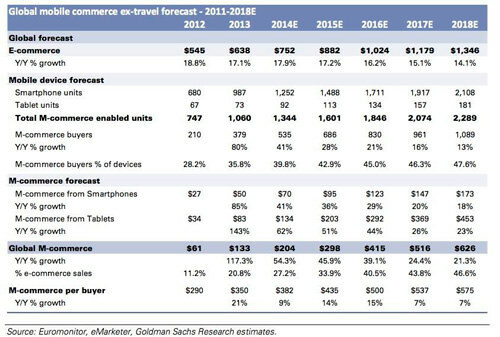 In fact, even Goldman Sachs are confident about the continual growth of mobile commerce. So much so that they estimate that 2014 will see $204 billion in mobile commerce transactions, while by the end of 2018, mobile commerce transactions will equal the amount of total e-commerce transactions conducted in 2013, a cool $626 billion. Sure, it’s a prediction, but the numbers are hard to ignore. Couple this with research findings from 2012 that indicated that 63% of respondents expected to be doing more mobile shopping over the next few years and you have a strong indicator that it’s time to get in on mobile commerce. On a related note, ad spend seems be tipping in favour of mobile right now, another indicator of the way things are heading. EMarketer estimates that, in 2014, desktop search ad spend will decrease by as much as $1.4 billion, down to $13.57 billion, while mobile search ad spend will increase up to $9.02 billion; yes, there’s still a nearly $5 billion gap in ad spend, but bearing in mind the growth of mobile Internet usage and mobile transactions, it’s not hard to imagine that advertisers will one day be spending more on mobile advertising than they do on desktop advertising. Even if you run a traditional brick-and-mortar retail store, you can still benefit from smartphones and having some sort of mobile-friendly retail presence, whether it’s in the form of a responsive website or native app. For instance, research by Latitude from 2012 showed that a vast majority of respondents – 88% – agreed that having a mobile device that could provide real-time information actually made them more spontaneous when shopping. 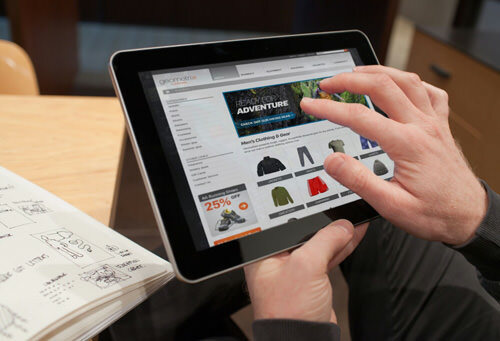 A report from xAd and Telmetrics showed that purchase intent was high for both tablet and smartphone users, with 60% and 53% of users respectively making purchases related to their online activity. What’s most interesting about this, though, is that more than half – 53% – of all mobile users, and 74% of all smartphone users, were found to be making their purchases offline or in-store. Showrooming, the act of browsing retail store shelves yet using one’s smartphone to look for and purchase a better deal online, is often cited as a problem, yet a survey conducted in April 2013 showed that even amongst the 21.85% of respondents that showroomed, most (54%) ended up buying from the same retail chain anyway, albeit from the chain’s online store. So, as you can see, it’s important to make sure that any customers who happen to be showrooming end up buying from your store anyway, and the best way to do that is to make sure your online store is mobile-friendly. At the end of the day, given the large and ever-growing number of mobile Internet users, the biggest reason to have a mobile friendly website is just the fact that a mobile-unfriendly website has every chance of driving potential customers away. 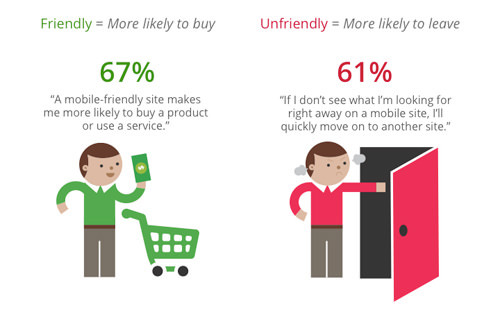 Even as early as 2012, a study from Google showed that mobile-friendliness was a key factor in purchase decisions, with 67% indicating that a mobile-friendly website made them more likely to buy a product or use a service. In addition, 61% indicated that a bad mobile experience made them more likely to leave. And it’s not just customers that you stand to lose: the same study found that not having a mobile-friendly website actually hurt customers’ perception of the brand: 52% of users indicated that a bad mobile experience made them less likely to engage with the company, while 48% felt that a lack of mobile-friendliness made them think that the company didn’t care about their business. Other research has provided similar information: Latitude reported that a good mobile experience improves brand perception for 61% of people. In fact, given the emphasis Google seems to place on responsive, mobile-friendly web design – including a dedicated set of resources to making your website work across multiple devices – it’d be silly to not listen: after all, Google does rule the roost in terms of search, and it’d probably be in anyone’s best interests to do what Google likes, lest it harms your search rankings. All of this isn’t to say that "traditional" e-commerce – purchases made on desktop and laptop computers – is dead and that you should move on to m-commerce. The intention here was to highlight the way in which mobile commerce can no longer be ignored, and the reasons why your business and e-commerce venture(s) should be mobile-friendly.